Okay, okay, I am definitely late to the party on this series! My mom gave me this series YEARS ago! And I have loaned it out to several people, but I had NEVER read it myself. Why? Why did I wait so long?! This was a fantastic series and I devoured it in less than 2 weeks! OH MY WORD!!! So good! If you have not read it and you like suspense then I suggest you hop on the band wagon as well and jump in, you won't regret it! As Deni and her father are getting off an airplane the unthinkable happens. Planes start dropping out of the sky. Everything electronic stops. People have no idea what is happening. Cars are stalled in the middle of roads, cell phones no longer work. No electricity. Deni and her father Doug start making their way home from the airport hoping against hope that electricity is still on in their neighborhood. Unfortunately it isn't and after Doug and Deni's harrowing trip home it looks like things are only going to get worse. As criminals start coming out of the woodwork and people start an "every man for himself" mode, Doug must protect his family and still provide for them. In a world that has gone chaotic Deni is sure clueless! A 22 year old self-centered, spoiled brat is more like it! Oh my goodness I wanted to smack the snot out of this character! She wore me out! Not only was she self-centered and put herself in danger, but she also put her family in danger. Ugh! All Deni can think about is her upcoming wedding and how the whole situation is an inconvenience to her and her plans. Everyone is in survival mode, but Deni, like so many others, is only worried about self. The action is non-stop and the drama made me weary, but I enjoyed every bit of this story and couldn't put it down. Now that the Branning's and most of the family's in the area have a routine with the lights out Doug is focusing on spiritual matters. When a couple of children are caught in the Branning's home robbing them Jeff chases them down and finds that they have been abandoned by their mother. Even though Kay knows they need every bit of food they can scrape together for her own family she insists on taking the children in until their family is found. With the government getting ready to issue limited funds to people the children are a hot commodity and once again crooks come out of the woordwork to try and line their own pockets. Just when we think that Deni and Mark may be getting close Deni's fiance shows up to muddy the waters and Deni's feelings. She is once again lured in by the promise of how wonderful their life will be after the pulses stop. Again, I am frustrated at Deni's immaturity. I think I compare a 22 year old with myself at that age. At 22 I was a married woman with a child. So to me Deni's fit-pitching and indecision stink of immaturity and teenage behavior. But Doug and Kay brought this on themselves by overindulging their children. So what should I expect? Anyway, People are after the children in order to get the money that the government plans to give every individual. Thieves are still abounding and there is still the mentality of taking care of one's own. Another page-turner! With Craig out of the picture Mark has been able to get closer to Deni. There is another killer on the loose and they are bent on framing Mark for the attempted murder. Mark is trying to be the provider for his family, he is trying to be the best example of Christ that he can be but it is hard when you are wrongly accused. It is even harder to convince people of your innocence when you are the son of a murderer and there is a vigilante group out to get you. We see some maturity in Deni in this book. And a lot of spiritual content. 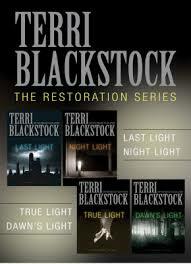 I love that about Terri Blackstock's books! Forgiveness is the theme and it is tested and tried and our human struggles with it are covered perfectly. My frustration was with Mark this go-round! ha! He was very insecure. Of course he would be with how he was raised and by whom he was raised. It looks like the pulses are starting to die out so maybe restoration is on the way. But at what cost to humankind and at what cost to Mark and the Branning's? The pulses have ended! And who shows up to stake his claim on Deni's heart? Craig! Ugh! That guy is like a bad penny that will never go away. I don't like him and I certainly don't trust his claim of becoming a believer. Thankfully neither do the Branning's, but they still put him up as he is the one that is heading up bringing electricity back to the community. And what is up with Beth? Of course we as the reader know what is going on, but her parents and people around her have no clue what has happened to the bright light that used to shine out of this young woman. I sobbed people!!!! I haven't cried like that over a book since Jennifer died in the O'Malley series! And that is all I'm going to say about that! Excellent book. Lot's of maturing for all characters. Testing of faith, questioning faith, going through the fire, and coming out on the other side victorious. Heart-breaking BUT oh so wonderful! There you have it y'all! Like I said, I finished this series in record time because I devoured them. I loved the spiritual struggles that each character went through and the maturing in faith that happened throughout the series. Excellent series and I'm so glad that I finally sat down and read them!